How much sediment is exchanged between North Sea and Wadden Sea and what are the dominant processes? How do bed forms in the channels and on the shoals look like and do they migrate? What is the sediment composition of channels and shoals? Where can we find worms or bivalves on the ebb-tidal delta and how abundant are they? To answer these questions, and many more, recently a unique field campaign was carried out in the Ameland tidal inlet system from the end of August till early October as part of the SEAWAD and Kustgenese 2.0 projects. In these projects NCK partners Rijkswaterstaat, Deltares, Delft University of Technology, Utrecht University and University of Twente join their forces. To give a short overview: Five frames were deployed on the delta, each one fully equipped to measure flows, turbulence, waves, bed forms and suspended sediment size distributions and concentrations. Further, many box-cores and bed samples were taken for benthos and sediment analysis, sediment tracers were released and recovered, Jet-ski’s and Zodiacs assisted in drifter experiments, 13-hour transect measurements were done, bed levels were measured by Multibeam, and Aquadopp profilers measured flow across the tidal watersheds. In total 6 ships and over 35 people were involved. A lot of valuable data has been gathered and coming months and years the data will be analyzed. There was a news item on the national television (Watch from 09:48) featuring Bram van Prooijen (TUD) and Judith Litjens (RWS). Furthermore, there was an item in KRO Brandpunt, featuring Laura Brakenhoff (UU) and Judith Litjens (RWS), in which you can see the retrieval of the Aquadopp profilers. More information about SEAWAD, the field campaign and Kustgenese 2.0 can be found via the following links. 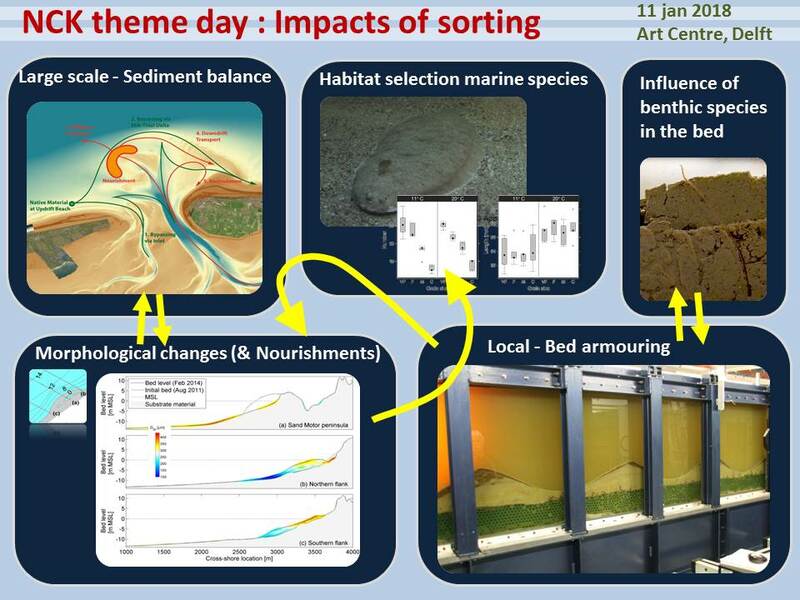 On Thursday, the 11th of January a NCK symposium entitled 'Impact of bed sediment composition on the environment' will be organised in the Art-Centre in Delft. The symposium will focus on the bed composition of the Dutch coast and the relevant abiotic and biotic processes in general. Two keynotes, by Steven Degraer (University of Ghent) and Maarten Kleinhans (University of Utrecht) will set the scene and several reseachers and PhD-students will share their insight and latest findings. The preliminary programme is now available on the event page. View it and register now! The first NCK symposium of 2018 will be held on Thursday the 11th of January and will focus on the latest insights in sediment sorting processes. We will inform you when the programme is available. Save the date! You can mark your calendars for the next NCK days! The 2018 edition is organised by TNO and will be held at Teylers Museum in Haarlem from 21 to 23 March. We will keep you posted on the call for abstracts and more information about the programme and registrations. We are organising a NCK theme day on meganourishments and dunes in The Hague on the 17th of November. The morning session is reserved for presentations and discussion about 3 large projects at the Holland dune coast: Spanjaards Duin, Sand Motor and Hondsbossche and Pettemer Sea Defense. In the afternoon we will visit 2 of the projects to explore their natural beauty. You can't register for this event anymore as the maximum number of participants has been reached. Photos and Book of Abstracts NCK Days 2017 now online!